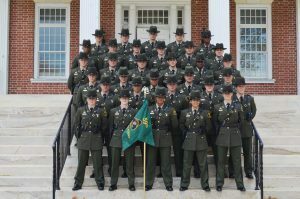 The ranks of the Maryland Department of Natural Resources Police grew by 44 officers—the largest increase in manpower in 13 years – in recent graduation ceremonies. The additions come as the state’s conservation law enforcement agency celebrates its 150th anniversary. Thirty-two recruits took the oath of office Nov. 3 and received their badges from Natural Resources Police Superintendent Col. Robert K. “Ken” Ziegler, Jr. The new officers received seven months of training at the agency’s live-in academy, based at the Maryland Police and Corrections facility in Sykesville. The keynote address was given by FBI Special Agent in Charge Gordon Johnson, a Frederick, Maryland native who supervises the Baltimore field office. The new officers have been assigned to patrol districts across the state and will complete their formal police training in the field under the supervision of experienced officers. The Maryland Natural Resources Police has the same jurisdiction and authority as Maryland State Police, and also enforces fish, game and boating laws, and is the state’s lead agency for maritime homeland security around bridges, power plants and the Port of Baltimore. The 32 new officers are: David Breakall, Mercersburg, Pennsylvania. ; John Bucher IV, Bel Air; Todd Cardarelli, Middle River; Cody Chaney, Williamsport; Aaron Cook, Baltimore; Jerimie Craig, Crofton; Jamill Elliott, Largo; John Gordy, Newark; Joseph Gukanovich Jr., Chester; Christian Helwig, Preston; Melissa Henderson, Oakland; Racquel Kavanaugh, Middle River; Amanda Kloetzli, Worton; Christina Lees, Stratford, New Jersey; Janice Lopez, Lusby. Also, Joseph Markiewicz Jr., Parkville; Jeremy Miller, Clear Spring; Bradly Mills, Clear Spring; Mitchell Muise, Jefferson; Christopher Parker, Sr., Upper Marlboro; Andrew Phemister, Lynchburg, Virginia; Lucas Pratt, Frostburg; Daniel Robinson, Annapolis; Jeremy Ryan, Salisbury; Luke Santerre, Port Republic; Christopher Stancliff Jr., Baltimore; Cody Thorne, Charlotte Hall; David Tosches, Perry Hall; Charles Tyler, Crisfield; Gloria Washington, Annapolis; Kerri Weale, Barclay; Adam Willey, Parsonsburg. Natural Resources Police also welcomed 12 officers who transferred from other law enforcement agencies in a Oct. 26 ceremony at the Maryland Police and Corrections facility in Sykesville. The lateral officers are: David Brown, Union Bridge; Michelle Burnette, Accokeek; Thomas Burt, Berlin; John Butts III, New Windsor; Timothy Hawkins, Williamsport; Gannon Lyons, Preston; Joy McClintock, Cumberland; Mark Miller, Sykesville; Anthony Pecoriello, Fallston; Adam Stanley, Marion Station; Tony Rossignuolo, Frostburg; and Shae Waters, Salisbury. This entry was posted on November 6, 2018 at 6:53 am and is filed under All News, Anne Arundel News, Calvert News, Charles News, Community, County, More News, Prince George's News, St. Mary's News, z 600X120 Top Ad Bottom, z 600X120 Top Ad Top. You can follow any responses to this entry through the RSS 2.0 feed.